The handcuff debate in fantasy football is a bit played out. For me, it all comes down to three factors. 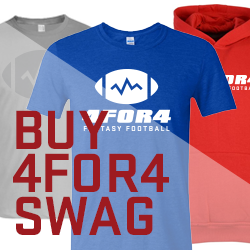 Does the player have standalone value even barring injury? Is the player capable of being a three-down back? Does the player have league-winning talent? If I am going with a Zero RB approach and a player doesn’t meet all three prerequisites, he is not even on my board. Who instantly comes to mind is Spencer Ware in Kansas City, but people are probably tired of me talking about him by now. Another great example of this -- a player I am trying to get everywhere in 2016 -- is Charles Sims of the Tampa Bay Buccaneers. On the heels of the team making Doug Martin the third-highest-paid running back in the NFL, it’s Sims that has Devonta Freeman-type breakout potential in this offense. Do I think Martin is a terrible player? Of course not. Is he limited? Absolutely, and that’s exactly why I see opportunity. Sims is a far more versatile player who excels where Martin struggles most frequently -- in the receiving game and in pass protection. For a team that projects to play from behind a ton this year, you are looking for a running back whose role is secure and is not driven by game flow. Sure if Tampa Bay is ahead, Martin may stand to get some more carries. This is obvious. What people don’t realize is that even if this happens, Sims role remains relatively unchanged. Last year, Sims actually saw more touches with the lead than when his team was behind. It’s amazing how much a consistent passing game role increases your floor -- Sims’ usage is not game flow dependent like Martin because he was arguably the Bucs' second-best receiver, which is a position they didn’t address in the draft. What matters is how much Sims' role increases when Tampa Bay is behind, a spot they will likely be in often in 2016. In that situation, Sims will play a significant role in this offense moving down the field. Last season, nearly half of Sims’ receptions came when the team was trailing in the fourth quarter or overtime. Martin will be a focal point of the offense -- the Bucs paid him to be -- but Sims’ role definitely has room for growth after his performance last season. Multiple beat reporters have stated Sims will see an increase in carries and former offensive coordinator and current head coach Dirk Koetter himself has called Sims “an every-down back, if need be.” Even without an injury, the team has said that to increase Martin’s “effectiveness and freshness”, Sims will see more work between the tackles. The Bucs will remain a run-committed team under Koetter, whose greatest constant on year-to-year has been heavy running back usage. With Martin taking a lot of the glory while enjoying his return to fantasy relevance, Sims was quietly the much more effective player in 2015 while playing in 42.0% of the team's snaps. Sims has the size of a feature back, but more impressively, he has elite mental processing skills, and football intelligence that is truly unique. He is not a flashy player by any means, but sees the field extremely well and recognizes penetration fast enough to help his quarterback consistently in the passing game if he senses danger. Sims' chart shows a relatively normal run distribution, with the majority of his runs coming through the middle, which may be surprising given the fact that he's thought of more as a sub-package, passing game back. Sims consistently makes plays through the various receiving avenues and types of routes, but surprisingly saw zero targets in the flat. Sims more frequently saw passes through the inside and outside areas of the field, and even lined up as a wide receiver 27.8% of the time, fourth-most of my initial 20-player sample. Sims' receiving skills are elite: only David Johnson and Ameer Abdullah graded as highly as Sims in the passing game of the players I have charted so far in this methodology. Sims catches balls with his hands, shows the ability to catch with his back to the quarterback, and can consistently make plays downfield. Throw in Sims' rare vision in the open field and his very good short-area burst, and his big-play ability should not come a surprise. Sims is a big back that is versatile enough to be a successful three-down back in the NFL. However, from an efficiency, or metrics, point of view, did he exceed or fall below expectation in 2015? The overall eSR for Sims and the Buccaneers was 45.0% per rushing attempt, the ninth-highest in the league and above the NFL average of 44.3%. Tampa Bay was also above average in pass protection, at 44.4% eSR per target. Per attempt, Sims was most successful to the left end with a 100.0% SR; though it was only 8.9% of his total rushing sample size, that's still very impressive. Only Sims and the aforementioned Ware boasted a 100.0% SR to any lane, regardless of sample size, which of course ranked first in regards to efficiency to left end. Sims was 4.4% above his team expectation through his largest sample size, the middle lane. Overall, he was above expectation and the league average through four of five lanes in regards to efficiency between the tackles. 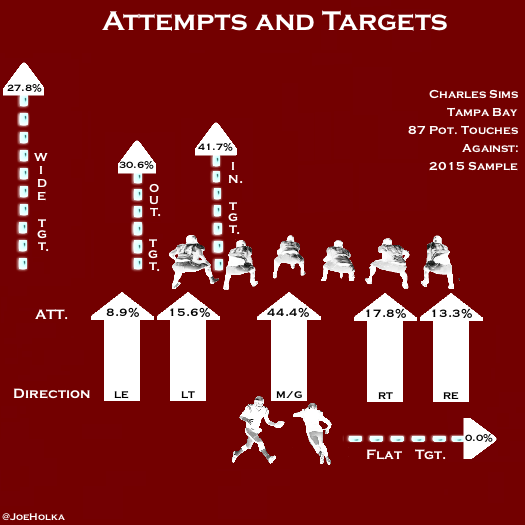 Per target, Sims found the most success with targets out wide (70.0%). His wide SR per target was the highest of my entire 20-player initial sample; the next closest was Duke Johnson (66.7%). Sims was ridiculously efficient through the inside as well, tying for second-overall in my sample (66.7%). In addition to per-target efficiency, volume through the air was also fairly consistent for Sims in 2015. He had ten games with three or more catches, totaling 70 targets on the season (seventh in the NFL). 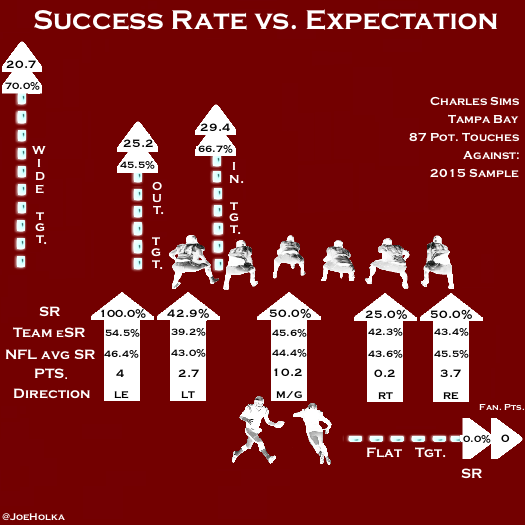 The results are exciting from an efficiency standpoint, let’s jump into Sims’ overall Rushing Expectation results to see if they support my grades and film evaluation. Behind statistically above average run blocking, Sims performed above expectation in his 2015 sample by an overall 3.9% mark in the run game and 16.7% above his eSR in the passing game. These numbers put Sims squarely in the middle (10th overall) of my initial 20-player sample in regards to his rushing expectation. However, his efficiency in the passing game was fantastic: he finished second highest of my initial 20-player sample. Sims was top-five in regards to overall performance above expectation, which combines his per-attempt and per-target data. Before Contact Yards are something I discuss at length in my introduction to Rushing Expectation. Elusiveness behind the line of scrimmage is an extremely underrated -- but prevalent -- ability among the league's best feature backs. Sims’ before contact yards (rushing) of 6.4 yards per carry were fifth-best of my initial sample. He is not the kind of running back who is going to lose yards often, even in less than desirable situations where his line does not block well in front of him. If you are new to my methodology, I chart yards before contact as the moment a player is handed the ball. I think what a player does as he approaches the line is just as important as what he does when he meets the line of scrimmage. Sims shows very good short-area burst and ability to accelerate well and use his speed to get to the corner. One thing I noticed is that he tends to bend runs more often than making violent, sharp cuts like a lot of backs. His cuts are small and precise behind the line of scrimmage, but he has the athletic ability and agility to make defenders miss. After first contact, Sims averaged a putrid 2.8 yards per attempt, second-worst to only Jeremy Langford in my initial sample. Sims has good power, in particular against corners at the second level, but showed marginal finishing ability to break through wraps and hits to his legs or below the knees. His balance through contact is minimal, especially through arm contact for such a big back. Part of the problem could be that Sims shows a lack of hip flexibility, combined with below average pad level, which contributes to issues converting his speed into power. For how efficient he was, Sims actually finished slightly below average against base sets with seven or less in the box in terms of success rate. However he was one of the few who actually had a higher success rate against loaded boxes than against soft ones. He tied with Dion Lewis for the highest success rate in the sample against eight or more in the box (60.0%). Sims is a mature runner who does a good job pressing running lanes before he reaches the line of scrimmage. Though he has an upright running style, Sims is a competitive kid who understands how to get downhill in a hurry. Being an asset in pass protection is an undervalued asset to Sims’ game. He performed well above average in this category (85.2%), but he must improve reading blitzes. One of the biggest knocks on Sims has to be touchdown upside. Despite his size, he lacked a consistent role between the tackles last season. Martin absolutely dominated that facet of the game for the Bucs, carrying the ball 41 times to Sims 14 in the red zone. However, Sims was sixth in the league at the position in red zone targets (10), though he converted just two into touchdowns. A positive is that Jameis Winston’s six red zone rushing touchdowns are likely to regress in 2016. Something that goes unnoticed in this situation is that Sims may have some of the highest odds of benefiting from an injury to his backfield counterpart (if you believe in that sort of thing). Martin has been injured a lot in his career, already missing fifteen games in his four-year career. We never root for injuries, but the upside of Sims as a bell cow in this offense is huge. Sims has standalone value already -- I already discussed how important that is -- but he also has three-down potential and league-winning talent. If he is able to secure just over half the touches, he could be one of the best values this year at the position. He has a nice floor of touches and targets in the passing game, but owns the upside of being a player that can score from anywhere on the field. 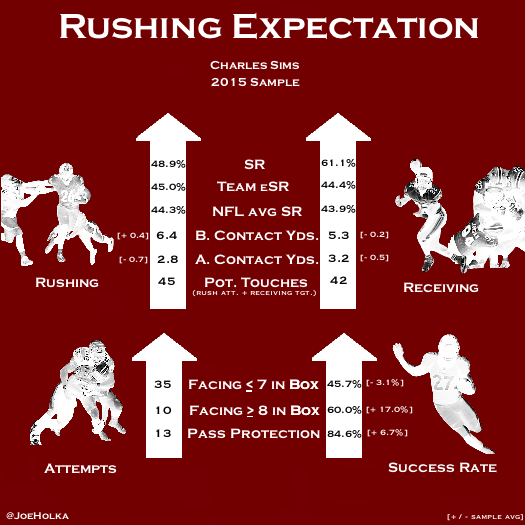 At a current ADP in PPR leagues in the eighth round, there may be no better mix of supreme efficiency, pass-catching floor, and situational upside than Charles Sims in 2016.